Dad and I were at the late, lamented World of Baseball Cards on Lemay Ferry Road in south St. Louis County sometime in the late 1980s, flipping through vintage cards. Among the old cards in the pile was a 1935 Goudey 4-in-1 featuring Cleveland Indians players. The most noteworthy was Joe Vosmik, an All-Star left fielder who batted .348 that year. My grandfather grew up in the Cleveland area. He went to medical school in Philadelphia, where he met his wife, and they ended up settling in Doylestown, about an hour and a half from Philly. 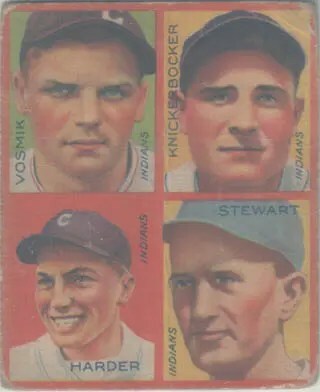 I don’t know if my grandfather treated Joe Vosmik at one point or met him some other way, though I do know my grandfather was a Cleveland Indians fan and, as such, never would have turned down the opportunity to meet Vosmik. Vosmik was one of the Indians’ better players, a right fielder who hit for high average with extra-base power. He was the son of immigrants from Bohemia, making him a classic American story, and if it hadn’t been for an eye injury he sustained in 1941 at the age of 30, he might have been a Hall of Famer because he retired with a .307 lifetime average and 1,642 hits. Most players start to decline after age 30, but if his decline had been natural rather than sudden, I think he would have had a shot. Vosmik had good company on the card. His teammate, pitcher Mel Harder, pitched for 20 years and won 223 games. He’s not a Hall of Famer either, but was a four-time All-Star, and 1935 was his second All-Star season. He was at the top of his game at the time the card was issued. Bill Knickerbocker was Cleveland’s young shortstop at the time. In 1935 he probably looked like he was going to be a star, but his fortunes faded a couple of years later. He lasted 10 years in the major leagues, but in 1937 when Cleveland traded him to the St. Louis Browns–ironically, along with Vosmik–his career began a sharp decline. Sometimes declines like those are due to injury and sometimes they are due to pitchers finding a trick to pitching him. Since Knickerbocker was able to hang on a few years as a utility infielder, that suggests he remained relatively healthy but just had trouble adjusting to the pitchers as his career wore on. The fourth player on the card was Lefty Stewart, a veteran pitcher the Indians had acquired in May from the Washington Senators. He had strung together a nice run earlier in the decade, and had been a 15-game winner as recently as 1933. It was a swap of struggling relief pitchers, and Cleveland got more use out of Stewart than Washington got out of Belve Bean, the other pitcher in the deal, but both pitchers were out of the majors by the end of the season. My grandfather would have thought this was a good card in 1935.